Each year the Wisconsin Society for Ornithology hosts the Honey Creek Birdathon/Bandathon fundraising event for the Harold and Carla Kruse Honey Creek Nature Preserve. This fundraiser helps preserve and manage this unique 372-acre property that WSO has owned since 1960. Proceeds help fund invasive species control, fence repair, as well as maintenance and property taxes on the site’s Cox Nature Center. Save the date! 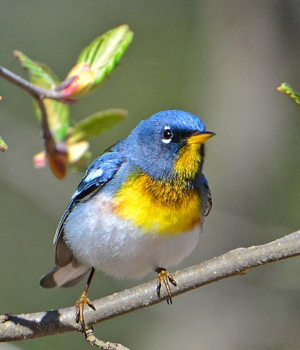 Incredible opportunity to view rock-star birds and preserve their habitat! Honey Creek is designated a State Natural Area and provides habitat for some of the state's rarest and most beautiful birds, such as Louisiana Waterthrush, Cerulean Warbler, and Acadian Flycatcher. The WSO owns and maintains this property. The Honey Creek Birdathon/Bandathon is the primary source of funding for maintenance of the preserve property. Our goal is to raise $10,000 for the removal of invasive species and maintenance of trails and the Cox Nature Center. Your past support has allowed WSO to replace and extend the boardwalk on its trail up the valley and to hire crews to scout and treat garlic mustard and Japanese knotweed. Donations have paid for mending fences after the spring floods, trail rehabilitation, property taxes, electricity and insurance on the Cox Nature Center, as well as liability insurance. Go on a bird walk led by Tom Schultz and Jeff Baughman starting at 8 a.m. (although early birding will likely begin around 4:00 AM.) NOTE: During the hike, the shallow creek needs to be crossed on stepping stones, so consider wearing tall boots. I enclose $__________ as a donation for the 2019 birdathon/bandathon. Your tax deductible contribution will go directly to the annual insurance and maintenance expenses for WSO's Harold and Carla Kruse Nature Preserve. You will receive a detailed narrative and results summary from the event! Please use this form to mail your completed pledge form and check (written out to WSO) to the following address: WSO HCBB, P.O. Box 217, North Lake, WI 53064. You may also donate online here: https://wso.wildapricot.org/donate. Please write "HCBB 2019" in the Comments box.